ATW-Hot Tub, Gameroom, Mountain Views! SPECIALS- BOOK EARLY FOR 2019 NOW! Description: This spectacular mountain retreat is loaded with everything you've come to expect in a premium luxury cabin and more! AGAINST THE WIND features huge decks with premium patio furniture, log rockers, a porch swing, stainless gas grill and oversized hot tub. All this set against a back-drop of mountain and wooded views that must be seen to be believed! If the weather turns bad, you'll be the lucky ones! Being stuck inside takes on a whole new meaning when you've got a 60' smart HDTV to keep you entertained. For the Football Fans we have the N.F.L. SUNDAY TICKET!!! Or how about heading down to the game room where you'll find pool, air hockey, foosball and an 8 game MS.PAC MAN machine to enjoy while the 40' Smart TV keeps you updated on all the scores. A stack-stone gas log fireplace, 3 king bed suites, Jacuzzi tub, and a fully equipped kitchen combine to make this the ultimate in luxury living! Located near TIPPY TOP for larger groups in need of multiple cabins, AGAINST THE WIND is ahead of the curve in luxury! The Cabin is unique in that it is not a typical cabin with only bear and woodsy decor setting, it also has it's own unique decor with a rock music setting in the game room level and main living area level area. We had a great week. Mark was very helpful with everything we asked. Nice cabin! The cabin is located in a gated community which is great for security, The cabins are close but not so close that you feel crowded. One note of caution if traveling in winter months...there are steep inclines going up to the cabin that could be a little tricky in snow/ice. We enjoyed our stay! We enjoyed our visit to Against the Wind. Our family shared time there over the Christmas break. The cabin was even decorated with a Christmas tree and lights for us! A lot of great amenities for the kids and the adults. Good WiFi and availability of tv choices with Netflix and Amazon prime video. 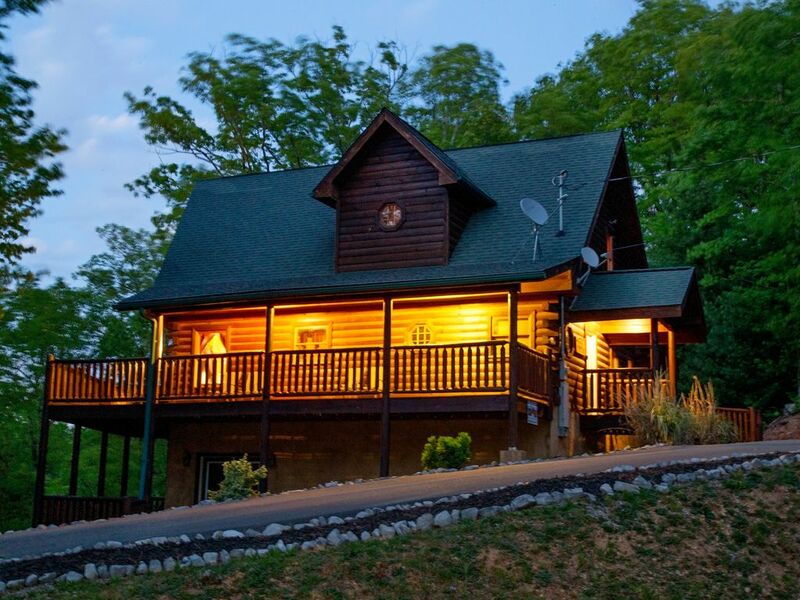 Super location with a very short drive to Pigeon Forge and Gatlinburg. Overall stay was great! Despite several issues! We really had a great time! Mark was a great help and an pleasure to work with us. Definitely would stay again despite a coup!e of issues. Didn't get the instructions that we needed to check in or out so had to run those down. (not sure exactly who's fault that was) But Mark handled it immediately. The cabin itself had a few issues such as the ice maker on fridge didn't work. The jets on the tub in master didn't work. Beds while frame was beautiful, not as comfortable as could have been. And the most important to me was no walk in shower in master bath. I am disabled and cannot do the tub bath so while it is wheelchair accessible a shower would have been great. If you need a large spacious home great for families this would be it. Our stay at Against the Wind was amazing! It was Close to Heaven on top of a beautiful mountain! The cabin is just beautiful and comfortable with everything we needed. The 2 decks have comfortable furniture, a gas grill and a beautiful view with woods surrounding. It was so quiet and peaceful, we had the most relaxing time. The downstairs has an amazing game room with pool, fooseball, air hockey and packman!! The owner, Mark, was very friendly, helpful, quick to respond and very very accommodating! Pigion forge is only 20 minutes away, Kroger is only 10 minutes away as well as a family dollar. Gatlinburg is about 30 minutes. The community is gated, which made us feel safe, there is a playground and a pool. Extremely nice community. We have rented other cabins in the past and this is by far THE BEST!! A beautiful place, a beautiful view, lots of fun and a great place to make family memories. My 13 year old daughter loved it as well, and you know how hard they are to please! My 80 year old mother also enjoyed it! I can't say enough about this wonderful cabin "Against the Wind"!! We will definately be returning. My family enjoyed our stay at "against the wind". Plenty of room and cozy! our stay was enjoyable from start to finish. Marks communication was outstanding throughout. We stayed for 4 night's.... wish it was longer! Comfortable cabin, but needed many minor repairs. The door to the microwave was broken so we had to open it by pulling on the bottom. The stove only had one rack in the oven. The provided baking pans are in need of replacement. Many light bulbs were blown out so we went to the dollar general and purchased new ones at our own expense. We do not like to security procedures that you have in place, we felt that they were very severe and discriminatory . We think that you should allow paying guest to bring guest to their cabin. We simply wanted to bring our brother in law to the room for dinner and he was denied access because he was not on the list at the security gate. The only option was to endure the embarrassment of waiting for the guards to try and reach someone at the rental office and after ten minutes we just gave up. We did not leave with a good impression of Shagbark due to your security procedures. I would strongly advise you to change your elitist high brow ways and stop treating everyone like they were criminals that you need to keep out. We Love Pigeon Forge and visit twice a year and this is the first time I have given a negative review.